The girls' Antique class ring is made of white lazon and is handcrafted in the USA by Gold Lance. The Antique class ring design has a rounded rectangular stone. 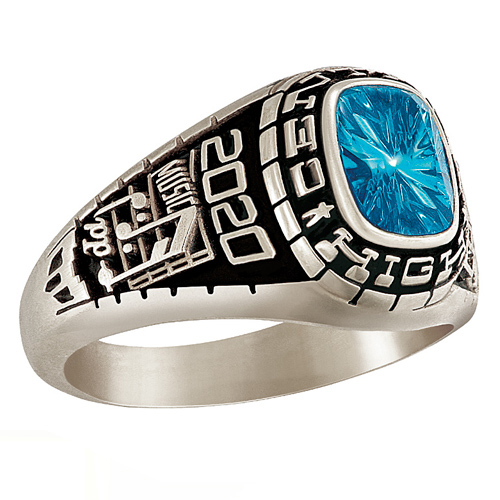 Personalize this ring with your choice of activity, school mascot, name and graduation year. My step daughters class ring was perfect! My ring didn't look like how I order it. The footprint doesn't appear on the ring like the product in the internet. AT this time I am not pleased with my product. I love my ring so much! It was worth the wait! I will be proud to wear my class ring. It is in style and substance what I'm made off. I love the detail and look forward to someday showing and telling my kids about this special ring. Thanks so much!